Vermeer is building the first five ZR5-1200 self-propelled balers to make available at a limited number of Iowa and Nebraska Vermeer dealerships — just in time for cornstalk baling season. These dealerships are in key cornstalk baling areas where the machines can put up a large number of bales during this fall season. The select dealerships have participated in specialized training to help support the ZR5. 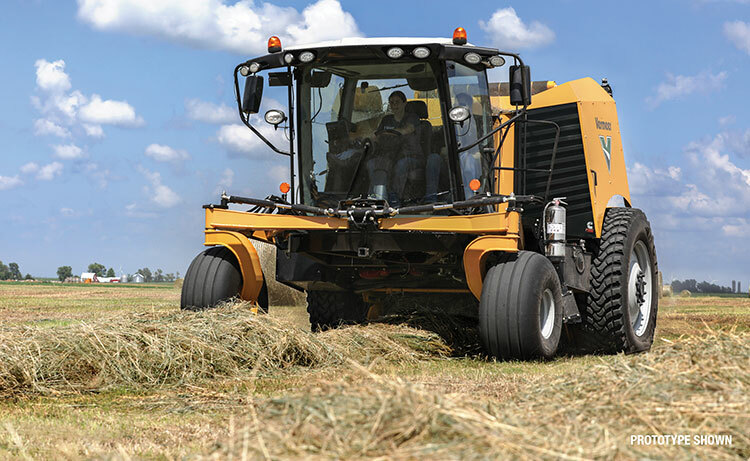 The first of its kind, the ZR5 self-propelled, zero-turn baler can make quick work of a field while offering an unprecedented level of operator comfort and maneuverability. A patent-pending independent suspension system within the ZR5 self-propelled baler allows operators to better handle the uneven ground conditions that naturally come with baling. Perhaps the most notable feature of the ZR5, aside from being self-propelled, is its zero-turn capability. The zero-turn feature provides two major benefits: (1) the increased efficiency when turning on the end row, and (2) the ability for the ZR5 to “quarter turn” when ready to eject a bale. The quarter-turn capability is part of an automated process. The ZR5 baler stops automatically when the bale hits full size. It then applies net and rotates the machine a quarter turn before ejecting the bale automatically. Positioning bales in a straight row can save up to 35 percent in time when it comes to picking up and loading bales. The ZR5 is hydraulically driven to help make real-time adjustments based on field and crop conditions. The automation of the ZR5 baler also helps increase efficiency of the overall baling process and helps create more consistent bale sizes. The ZR5 features a hydrostatic ground drive and a hydraulic baler drive. A 200 hp (143 kW) Cummins diesel engine powers the ZR5 down the road at 30+ mph (48.3+ kph), which is especially beneficial to commercial operators needing to move quickly from field to field. Machine maintenance is another benefit of the machine’s design. The bale chamber can be removed for maintenance in a matter of minutes, so producers can spend time more productively in the field.